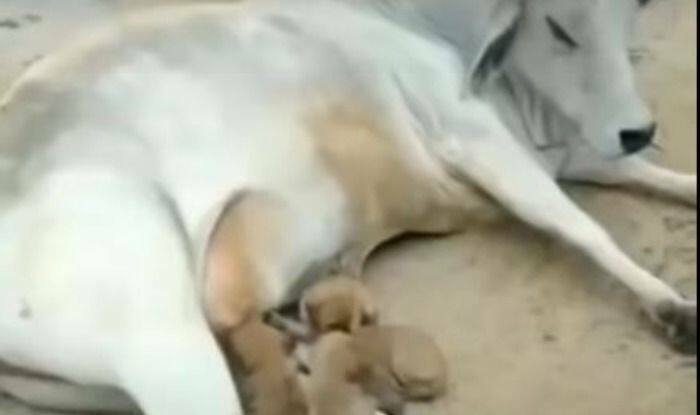 In what is considered to be a bizarre video, a cow in Uttar Pradesh was seen nursing four puppies on a street. The video was recorded by a bystander who couldn’t help but capture the unusual sight before him. As per the locals, the mother of the four puppies was killed in an accident not long after giving birth post which, the puppies were eventually adopted by the cow who now feeds them every day. Needless to say, the video went instantly viral for its heartwarming content, the moment it was shared. However, this is not the first time that we are hearing of unconditional love being shared between animals as the internet is filled with many such mushy animal videos. From a dog and a cat showering each other with cosy hugs to a monkey safeguarding a puppy like a mother, we have witnessed some incredible bond of love, care and affection that clasp the diverse animal kingdom together. Showing us the way to live collectively in a world where everyone tends to be selfish, animals are surely setting examples of interspecies friendships. In another video, a labrador was seen looking after 9 ducklings like its own puppies. The video too had gone viral a couple of months ago in which the pooch had taken over itself to tend and care for the ducklings after their mom left them. It is indeed charming to see how animal instincts work given that irrespective of the type, there have been cases where animals have helped other animals survive like their own. Talking of the video shared today, it is remarkable to see how this cow has turned to be exactly like a mother to the cute little brown puppies.